A note to our readers: In the process of assigning this post, we were informed that its author, historian Greg Grandin, was having his own Kissinger biography reviewed by the New York Times Book Review. While we were not informed of the date that the review would be appearing, it turns out to be in the same edition of the New York Times Book Review in which Roberts’ essay appears. In its review, the Times described Grandin’s work as a “fresh argument that, although more provocative than convincing, amounts to one of the most innovative attacks on Kissinger’s record and legacy.” This was relevant information that should have been included in the post, especially in a discussion of the ethics around writers’ conflicts of interest. We should have inquired with Grandin as to the timing of the review of his book and reported that fact in the post, and we apologize for failing to do so. This Sunday, the New York Times Book Review will publish a review of the first volume of Niall Ferguson’s authorized biography of Henry Kissinger, Kissinger: The Idealist. The reviewer is Andrew Roberts. Roberts brings an unusual level of familiarity to the subject: It was Roberts whom Kissinger first asked, before turning to Ferguson, to write his authorized biography. In other words, the New York Times is having Kissinger’s preferred authorized biographer review Kissinger’s authorized biography. The Times, too, normally checks those things. When I’m approached about reviewing books there, I’m usually asked if I know the author or have a conflict of interest. My friend Corey Robin had a relevant experience. When his book The Reactionary Mind was coming out in 2011, the Times contacted a widely respected intellectual historian to review it. The potential reviewer didn’t know Corey personally or professionally. Although they had never met, Corey had begun blogging that year, and he and the would-be reviewer began exchanging occasional comments on sites like Facebook. Minimal as the relationship was, the Times nixed the reviewer because of their putative entanglement. If Roberts were any more entrenched, he’d be wearing a Brodie helmet and puttees. So how is the review itself? Contrary to the bet that an opinionated yet informed expert might turn in an exciting piece, Roberts’s essay is ponderous, and, if possible, even more hagiographic than the authorized biography itself. Let me be clear: I think it would be totally legitimate if, say, Ferguson, with his well-known conservative politics, were to review my new, critical book on Kissinger. That might indeed make for an engaging, fun debate; readers would know where author and reviewer stand. However, asking Roberts to review Ferguson, without acknowledging their connections, not to mention Roberts’ history with Kissinger, is a trench too far. Thus a new genre is born: the authorized review of the authorized biography. Greg Grandin teaches history at New York University. He is the author of Fordlandia, a finalist for the Pulitzer Prize and National Book Award, and The Empire of Necessity, which won the Bancroft Award in American History. 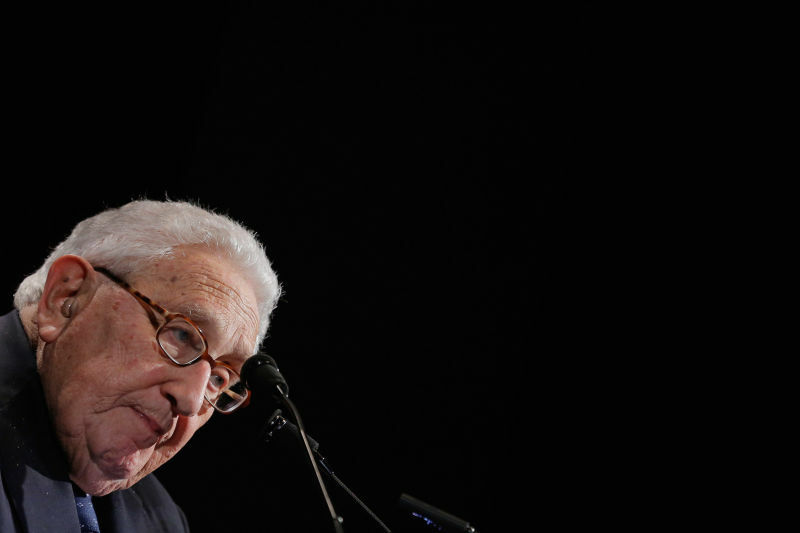 His new book is Kissinger’s Shadow: The Long Reach of America’s Most Controversial Statesman.